WASHINGTON, D.C. (2/18/15) – At last Obama has come to an intelligent conclusion about dealing with ISIS (his kinfolk) that makes sense. Forget about fighting back and becoming like them. It must be a more civilized way of dealing with this problem. We should send Social Workers to counsel them, get them jobs and bring them to America. Thus saith Obama's State Department spokeswoman, Marie Barf – TYPO – that is HARF, H-A-R-F (sorry) who suggested this initiation of a job-creation program which would address the 'root cause' of terrorism and make them stop the killing, and even make them like us. Yep, gotta get to those root causes which will solve everything. Interesting since the job market has plunged under Obama with more people unemployed than any other administration since 1929 and early 30's, jobs will be immediately found for our sworn Muslim enemies . And do we bring them here? In any case this is a marvel of government management to create jobs out of nothing, the same as creating money with nothing backing it. In an interview Monday evening on MSNBC's Hardball with Chris Matthews, (you remember Chris, he is the one who gets a tingle up his leg when he thinks of Obama), Ms.Harf stated: . "We cannot kill our way out of this war. We need in the medium-to-longer term to go after the root causes that lead people to join these groups, whether it's lack of opportunity for jobs .... We can work with countries around the world to help improve their governance. We can help them build their economies so they can have job opportunities for these people ..."
"We're killing a lot of them and we're going to keep killing more of them. So are the Egyptians, so are the Jordanians. They're in this fight with us. But we cannot win this war by killing them. We cannot kill our way out of this war. We need in the medium-to-longer term to go after the root causes that leads people to join these groups, whether it's lack of opportunity for jobs..."
Poor dears, they are simply misunderstood and underserved. That is why they are so angry. Let's see...we send in social workers to befriend them, ask them why they hate us so much, then make profuse apologies for the 'arrogance of America,' the spectacular success it achieved in a short time from its founding, becoming an astonishing military might, financial success with freedom of the people to practice Christian beliefs since the Bible and the ONE God were the base of America's founding and we had schools that actually educated people. We should not take pride in that, but rather we should hang our heads in shame for being Americans. A change is needed, a change promised by Obama right off the bat. And he has fulfilled that. 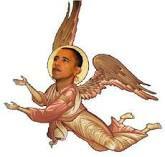 Obama is truly an angel. We should assure ISIS that we would let Sharia Law govern America and make certain that all taxes go to Muslims. Even though this might not produce a tingle up our legs, it may result in a chilling tingle in our spines. Actually, this is not a bad idea. Let's send Marie Harf, accompanied by Obama, over to talk and reason with ISIS. And with that humanitarian gesture, the crisis will be solved once and for all. As the man from Mens' Warehouse once stated, "I guarantee it." By all means, let's send them over there without further delay. Photo Caption: An angel from above or below?